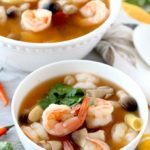 Thai Tom Yum Soup (Thai Hot and Sour Soup) is one of the easiest and quickest soups to make. The full flavored broth is infused with lemongrass, ginger and Thai chiles. 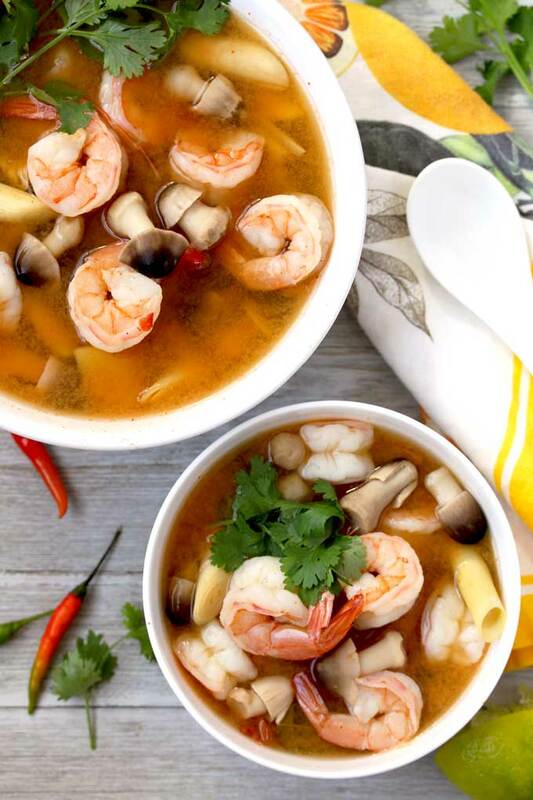 Plump Shrimp, straw mushrooms and fresh cilantro complete this delicious and warming Tom Yum Soup recipe. Instead of going out to a restaurant, you can make the most popular Thai soup at home in no time. 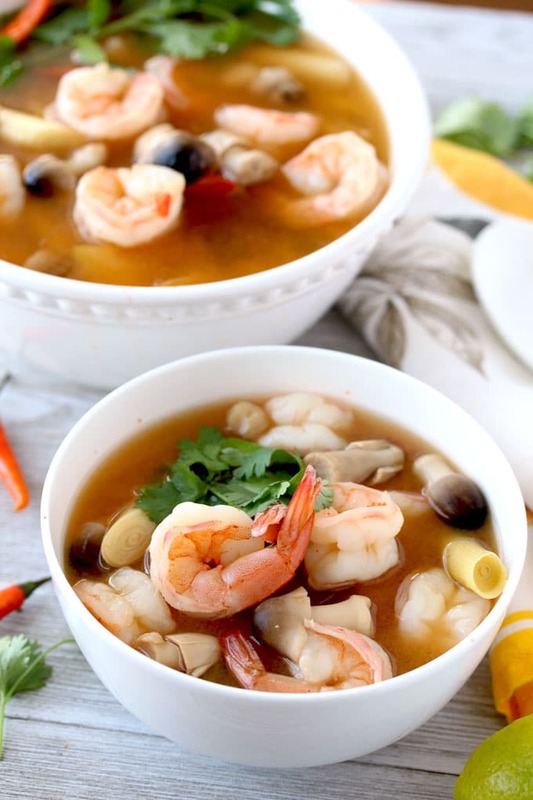 This Thai Tom Yum Soup will knock-your-socks-off! It’s light. It’s easy. It’s healthy. It’s gluten free. It’s flavorful and if you want, you can make it spicy enough to clear out your sinuses (guaranteed!). What is Tom Yum Soup? Tom Yum is a type of Hot and Sour soup that originated in Thailand. Commonly made with shrimp, it can also be made with chicken, noodles or even vegetarian. 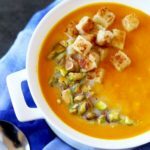 This soup is a breeze to make – which makes you wonder how can you develop so much flavor with such a few ingredients in such little time? It all starts with the broth! A good chicken broth like this Basic Chicken Stock or shrimp broth are always a plus. However, feel free to use canned chicken broth or seafood broth. We are going to infused the broth with lemongrass, ginger, lime leaves and Thai chile peppers. 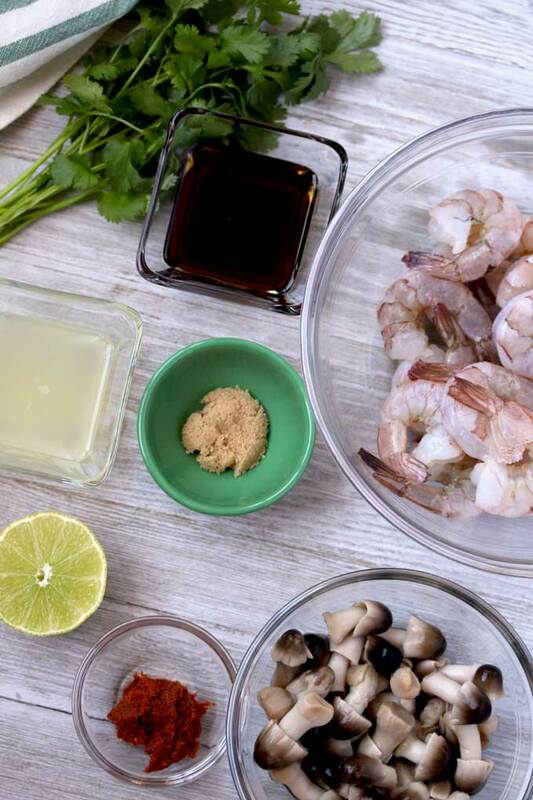 Transforming a basic broth into a flavor packed Thai broth! 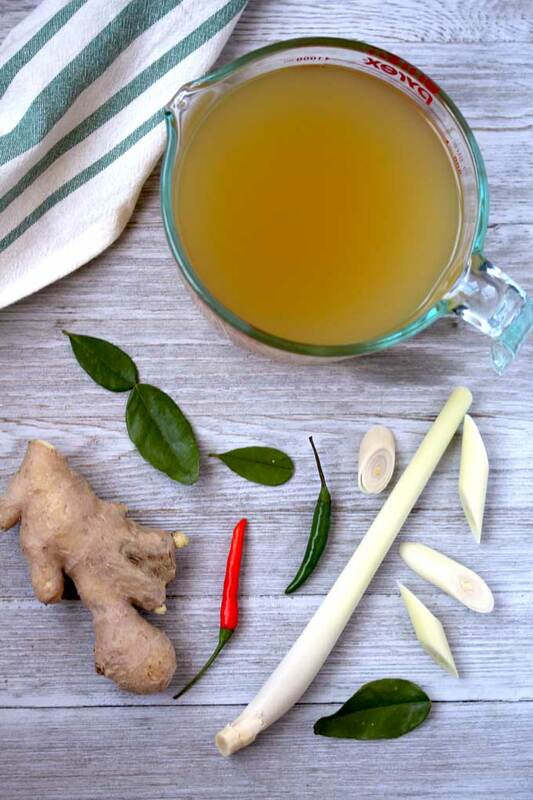 Authentic Thai soup uses galangal – a root similar to ginger. However, galangal is very hard to find in my neck of the woods so I always use ginger with amazing results. After a quick simmer, the rest of the ingredients are added. It only takes a few extra minutes and the soup is done! Garnish it with fresh cilantro and serve. Add Soba Noodles for a heartier soup. Cook the noodles according to package instructions (it usually takes 5 minutes), drain, rinse and place in a soup bowl. Pour the soup over the noodles and enjoy! Tomato cut into quarters. Add them at the same time you add the mushrooms. Sliced onions. Add them at the same time you add the mushrooms. Instead of straw mushrooms, you can add sliced Shiitake or white button mushrooms. Sliced scallions. Add them with the cilantro. 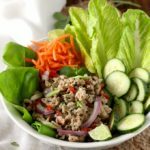 Heads up – fish sauce does not smell good! Do not let that stop you from making this soup or any Asian dish. If you cannot find Thai chiles, you can use chile de arbol or jalapenos. Remove the shrimp tails for easier slurping! The complete name of this soup is Tom Yum Goon! 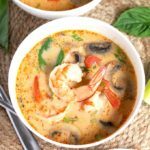 WANT TO TRY THIS THAI TOM YUM SOUP? PIN IT TO YOUR SOUP OR ASIAN FOODS BOARD!! Thai Tom Yum Soup (Thai Hot and Sour Soup) is one of the easiest and quickest soups to make. The full flavored broth is infused with lemongrass, ginger and Thai chiles. Plump Shrimp, straw mushrooms and fresh cilantro complete this delicious and warming soup. In a medium pot, bring the stock to a boil over medium heat. Add the lemongrass, lime leaves, ginger and red chile peppers and lower the heat to medium-low. Cover the pot an simmer for 20 minutes. Uncover the pot and add the fish sauce, lime juice, brown sugar and red curry paste to the broth. Stir and simmer for 5 minutes. Add the mushrooms and the shrimp and cook for 6 to 8 minutes or until the shrimp is cooked through. Turn the heat off and add the cilantro. Serve (see notes). When making the Thai broth, I usually add the chiles whole so I can control the heat level better. The lemongrass and lime leaves are not to be eaten. You can remove them before serving if you wish. Red Curry paste is spicy. If you are not familiar with it, add 1 tablespoon and taste. You can add more if desire. Having just returned from working a month in Bangkok, I think this recipe is the most authentic i have seen available on the internet. The street vendors with their roll around carts start with a pot of broth and a pot of boiling hot water. They have a cooking basket on the end of a long bamboo handle, typically throw in a hand full of glass noodles, add the chicken (gai), or pork (moo) , along with whatever you choose, green onions, garlic, chicken liver, etc, immerse the basket in the boiling water bath for half a minute, pour it in a bowl, ladle the broth over the contents and the customer is free to add at no extra cost mung beans, cilantro, chopped peanuts, fresh cilantro,the standard quartet of each style of chili, dried, sliced, stewed, floating slices in vinegar, along with each vendor’s own specialty concoctions using special parts of the chicken or pork along with their own blend of spices., and all for the amazing cost of Baht 40 which is a little over a dollar. What a deal. Or you can go to a restaurant and get a similar dish for $5/$8. Hi Clayton, thank you so much for sharing, I cannot wait to visit Thailand! You transported me for a few minutes and I am thankful for that. Thanks for the feedback. We love this soup and make it quite often at home. We also add a few other ingredients once in a while. Thanks gain!